Preheat oven to 180°C (160°C fan-forced). Lightly grease a 23cm-24cm fluted loose-bottomed flan tin. Place the flan tin on an oven tray. Process the biscuits in a food processor until fine crumbs. Stir in the melted butter and almonds. Press the mixture into the base and side of prepared tin; refrigerate while preparing filling. Beat sweetened condensed milk, yolks, lemon rind and juice in a medium bowl with a electric mixer until thick and smooth (about 3–5 minutes). Pour filling into the biscuit crust and bake for 15–20 minutes or until just set. Cool to room temperature then refrigerate for 3 hours or overnight. Cut off the cheeks of the mango, nectarine and plum, then slice very finely. 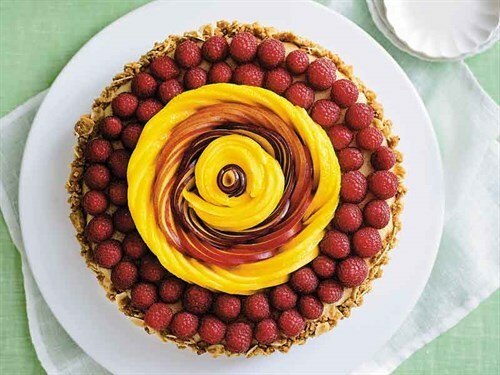 Arrange the raspberries around the outside of tart, then position the mango, nectarine and plum slices, then mango and, finally, a few more plum slices, overlapping slightly.